Smith & Wesson (S&W) M&P Pro CORE (Competition Optics Ready Equipment) Combat/Tactical/Competition Pistols: Good to Go and Ready to Beat Glock Pistols? | DefenseReview.com (DR): An online tactical technology and military defense technology magazine with particular focus on the latest and greatest tactical firearms news (tactical gun news), tactical gear news and tactical shooting news. On November 7th (2012), Smith & Wesson issued a press release on the S&W M&P Pro Series C.O.R.E. (Competition Optics Ready Equipment) series pistols, which are being built by the S&W Performance Center. The guns look good, and DefenseReview.com (DR) writer/contributor Jeff Gurwitch is chomping at the bit to run test samples of them at the range. While Performance Center guns tend to be terrific, and every Performance Center gun DR has ever owned or fired has been both accurate and a pleasure to shoot, we would still like to see how the new CORE pistols do at high round count under adverse conditions in military-level/grade reliability, accuracy and durability testing (combat optics aside) before we sign off on them. We're also interested to see how the all the M&P CORE models perform against the Gen-3 and Gen-4 Glock pistols, and we're most interested in how the Smith & Wesson M&P9L Pro Series C.O.R.E. performs against the standard Glock 34 (G34) "practical tactical"/competition pistol with a comparable combat/competition red dot optic on it. In my conversations with Mr. Gurwitch, he's told me that the Glock 34 pistol fires "smoother" than the standard S&W M&P9L, in his experience, so the question is whether or not the S&W M&P9L Pro CORE will change that dynamic, and how it compares to both a standard G34 and a custom modified and tuned G34 pistol, as well as the price point difference between a M&P CORE and custom G34 with comparable features and optics. Understand that Gurwitch is both a military Special Operations Forces (SOF) assaulter/operator AND a competitive 3-Gun shooter, so his opinion on how various pistols he uses stack up to each other carries A LOT of weight with us. He doesn't like the fact that Smith & Wesson has placed the M&P pistols' loaded chamber indicator hole right where dirt, sand, etc. can cause trouble, i.e., right at the case rim/primer area, if it manages to get in there. He told us there was some TV show (Guns & Ammo TV?) where guys with lab coats ran some kind of sand/debris test and experienced failures with the M&P pistol because sand or dirt got in that hole. If this hole indeed lets debris into the action and can lead to malfunctions, then, in our opinion, it constitutes an inherent design flaw that should be removed. Since the hole is half carved into the barrel hood and half carved into the slide, both the barrel AND the slide would have to be retooled to fix it. Another problem with this type of chamber indicator is that you can't perform a tactile chamber check in the dark like you can with a Glock pistol. Assaulters/tactical operators and civilian tactical shooters should even be able to feel the Glock's chamber indicator/extractor while wearing tactical gloves, since we were able to accomplish this while wearing Line of Fire (LOF) Stryker Extraction Gloves with the index finger pad portion of the glove intact. A lot of people, including me, prefer to cut out this section of the glove on either their primary/firing hand or both hands (for ambidextrous shooting capability) to achieve a better trigger pull. So that's always an option, as well. LOF tactical gloves are currently DR’s favorite tactical shooting glove, by the way, and we really like the way the LOF Stryker Gloves look and perform. Next up is the M&P pistol's extractor versus the Glock pistol's extractor. The Glock's extractor can be quickly and easily replaced in the field at the operator/end-user level with a little (basic) knowledge (or by using a Glock armorer's manual) and a Glock armorer's tool. It's DR's understanding that the M&P's extractor currently cannot be likewise field-maintained/replaced, and instead must be replaced at the armorer's level due to the difficulty/complexity in removing and replacing it. So, if you're running an M&P pistol and your extractor fails in the field, chances are, you're done using that pistol operationally or competitively until you can get it back into a M&P armorer's hands. The main downfall of the M&P 9mm is the wildly varying accuracy thanks to some QC issues and design flaws. The M&P 9 barrel uses a tragically slow 1:18.75" twist, which does a poor job stabilizing heavier bullets. To add insult to injury, the M&P also unlocks extremely quickly. This early unlocking tends to negate any conventional wisdom on what bullet weights should shoot well with the M&P, and you'll want to do a bit of experimenting. The Glock is inherently more accurate than the M&P, and will shoot 3" or better at 25 yards with a wide range of ammunition. I feel that 3" or less is a good measure for service pistol accuracy at 25 yards. My 3 primary M&P 9mm's will all shoot 3" or better at 25 yards with any 147 grain ammunition that I feed them, and two of them have printed 2 5/8" standing offhand at 25 yards with 147 grain. That works for me. However, all three of the guns shoot about 6-8" at 25 yards using 115 and 124 grain ammo. My solution at this point is just to stick with 147 grain. Having to limit one's defensive 9mm ammo choices to 147gr ammo is unacceptable, in DR's opinion. So, let's hope Smith & Wesson has since solved the twist rate and unlocking time problem,s if "Hilton" is correct and those are indeed the the problems, and the only ones. By contrast, the S&W M&P .45 ACP pistols are, according to information we've received from sources outside Smith & Wesson, significantly more accurate, since they had to meet a military accuracy spec for the U.S. military's Combat Pistol requirement awhile back. However, even if there were accuracy issues with the standard 9mm and .40 S&W M&Ps, the S&W M&P Pro CORE pistols, being S&W Performance Center pistols, are most likely all very accurate. DR is anxious to see how good the triggers on the various M&P Pro CORE pistols are, and how they compare to the latest Apex Tactical Specialties aftermarket M&P trigger kits. Taking this a step further, we'd like to see how the new S&W M&P Pro CORE pistols stack up feature-wise, performance-wise and price-wise versus the Bowie Tactical Concepts (BTC) custom M&P pistol packages that look curiously similar to, and predate, Smith & Wesson's factory-produced CORE guns. Perhaps the BTC custom M&P pistols served as some inspiration? The latest BTC custom guns also utilize an interesting red dot combat optic (mini red dot sight)/rear fixed sight setup where the rear fixed BUIS (Back Up Iron Sight) is placed in front of the red dot sight, as opposed to behind it, in order to provide an unaccluded view of the red dot sight picture. The rear BUIS, now sitting in front of the glass, co-witnesses the bottom third of the red dot sight. BTC appears to have an affinity for the Trijicon RMR Sight (LED) (RM02) and Leupold DeltaPoint Reflex Sight. BTC also customizes Glock pistols. They can re-contour the Glock's grip to what appears to be a 1911 pistol grip angle, and they can add an extended beavertail grip tang. By the way, BTC is run by David Bowie, of course…who else? Speaking of an extended beaver tail grip tang, most of the S&W M&P pistols feature an extended tang, which is a feature that I personally really wish Glock pistols also featured, since I've always experienced slide bite on the inside of my primary/firing hand thum knuckle when doing a lot of fast shooting during training. An extended tang also aids if fast shot-to-shot recovery and control during fast multiple-shot strings on multiple targets. While the Glock 19 (G19) pistol is still my primary concealed carry (CCW) gun, it could still use a little "perfecting", in DR's opinion, and an extended grip tang is a feature we'd really like to add to it if we can find someone we trust to do it right at reasonable cost. Perhaps we can trust Bowie Tactical Concepts to do it. We've never spoken or dealt with them, but their work certainly looks good in the pictures we've seen. We'll try to reach them to find out their pricing and turnaround time. Finally, DR would like to see how the S&W M&P Pro CORE and Glock pistols are able to handle Atlanta Arms and Ammo 9mm Major loads (match ammo) for competition. We're guessing that a KKM Precision barrel with fully-supported chamber would be required for any Glock pistol firing 9mm Major. Disclaimer: DR would advise our readers to check with all companies involved to make sure that 9mm Major ammo is safe in the S&W M&P and Glock pistols (or any 9mm pistol, for that matter), even when using barrels with fully-supported chambers. Frankly, we're not sure. "SPRINGFIELD, Mass.– Smith & Wesson Corp. today announced that four new models have been added to the Company’s premier line of M&P® polymer pistols. Based on the popular Pro Series line of competition ready firearms, the new M&P C.O.R.E (Competition Optics Ready Equipment) models offer consumers a specialized platform for adding accessory optics to their personal handguns. Engineered to accept six popular styles of competition based optics, the M&P C.O.R.E models are easily adapted to meet any demand. At the foundation of the new M&P C.O.R.E. resides a specialized mounting platform on the slide of the pistol that can be conveniently changed to match the desired optic. Through the use of removable brackets, consumers are able to simply install the corresponding mounting screws to achieve the precise fit and height required. Designed to work in conjunction with the Trijicon RMR, C-More STS, Leupold DeltaPoint, Docter, Insight MRDS and JPoint, the M&P C.O.R.E. offers quick and custom sight installation for the industry’s top aftermarket red-dot sight manufacturers. The new M&P C.O.R.E. models will be available in both 9mm and .40 S&W with either a 4.25 or 5-inch barrel configuration. Engineered as a true competition platform, each model will retain original design features including a polymer frame with a through-hardened stainless steel slide and barrel, ambidextrous operating controls, striker fire action and Melonite® finish. 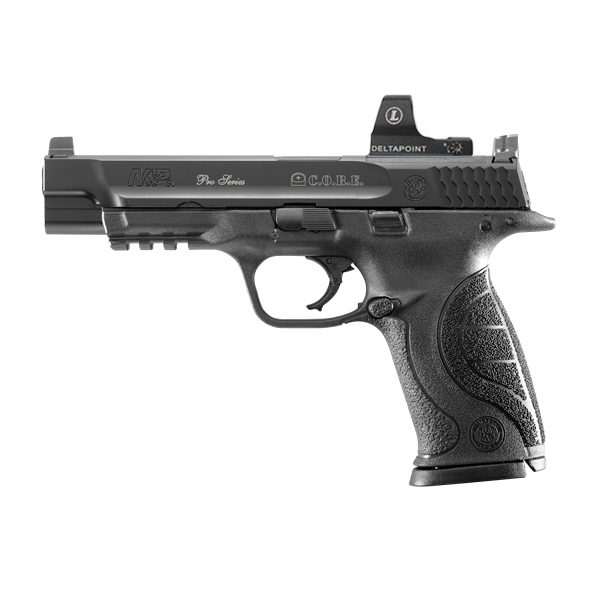 For improved handling the M&P C.O.R.E. models feature a new textured interchangeable back strap with prominent stippling. Three patented palmswell grips are supplied with each pistol, providing shooters the ability to tailor the grip size to their personal preference. 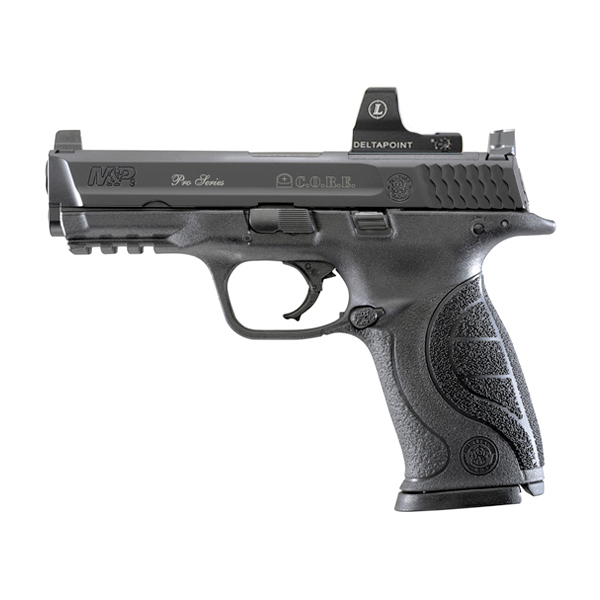 For improved accuracy and precise shot placement during competition, the M&P C.O.R.E. pistols are standard with a Performance Center sear. The specialized sear allows for a crisp 4.5 pound trigger pull along with a faster, defined reset in between shots. On top of the slide, Smith & Wesson has added higher sights that can be used in concordance with the mounted optic. Other standard features of the new pistols include a crowned muzzle for improved accuracy, picatinny-style equipment rail and reversible magazine release. Smith & Wesson Holding Corporation (NASDAQ Global Select: SWHC) is a U.S.-based leader in firearm manufacturing and design, delivering a broad portfolio of quality firearms, related products and training to the consumer, law enforcement, and military markets. The company’s brands include Smith & Wesson, M&P and Thompson/Center Arms. Smith & Wesson facilities are located in Massachusetts and Maine. For more information on Smith & Wesson, call (800) 331-0852 or log on to www.smith-wesson.com." Next: Gun Rights Advocates Win a MAJOR Case for Second Amendment and Concealed Carry (CCW) Rights in Illinois: Legalized Concealed Carry in Chicago, and Eventually Nationwide?